Well this is a project that in the summer I seemed to have timed to perfection, just as the UK reached temperatures that rivaled Palm Springs, I decided to create an outdoor dining area. I wanted to be creative and upcycle some old furniture making it look great but also protecting it from the elements.and to create an area in the garden that would not only look amazing but wouldn’t cost a fortune. My master plan was to create a space in the garden that acted as an additional room, a really social space, somewhere that would have my neighbours making excuses to pop over and join you for a drink at the drop of a hat. I had an old farmhouse dining table that I wanted to use, I painted it a few years ago but it was very much in need of smartening up and weather proofing. You can buy old tables on second hand sites such as www.Preloved.co.uk very reasonably and with good quality outdoor paint like I used any table can be transformed to be weather resistant. There are so many paints on the market at the moment that claim to be ‘outdoor paint’ but I have always trusted Ronseal for my outdoor projects.This time it was no different, Ronseal have a colour called Midnight Blue which I just knew would add a touch of sophistication to the garden. I wanted a colour that would have a real impact not the usual pastel garden colours that everyone expects, I think using dark colours in your garden looks great as its a real contrast with the colours of nature, against a darker backdrop the plants in your garden really stand out, this is also why I love the look of black sheds and summerhouses buts thats’ another blog and I digress. I had also salvaged a very old fireplace and wanted to paint that in the same colour. I love the idea of outdoor fireplaces in the garden creating a focal point and really adding to that feeling of an additional room. They are also great places to display plants, lanterns and candles helping you add some style to the area. Before I started painting both the fireplace and the table I made sure I gave them a good clean and sanded off any old paint.Don’t rush in to the job,good preparation always ensures a great finish, you don’t want to be painting on top of old flaky paint. If you have an electric sander this is the time to dig it out and plug it in, it can save your arm muscles and speed the job up. Once the wood was prepared it was time to paint. A quick stir of the paint and a good quality brush and I was good to go. Ronseal outdoor paint was easy to use and gave great coverage, don’t worry that the first coat looks a little patchy thats normal as you form a base layer, the second coat will even it all out. One of the biggest mistakes people make then they paint is they look for complete coverage on the first coat and apply it far too thickly. Thin even layers are what you need.Please note it was a coincidence that my nail varnish matched the midnight blue colour of the paint not even I would go to that level of styling attention to detail !! The drying time of the paint was superfast, helped by the fact that it was a sunny day and which made the job quick and easy. Always let each coat dry properly before painting the next one so that you can get a smooth finish. I always find that ‘drying time’ is the perfect excuse for a cuppa. The fireplace was transformed and I loved the blue colour, the paint adds a slight sheen but is not a gloss and really brought the wood back to life. The fireplace looked new by the time I had finished. I wanted to keep the top of the table plain wood, if it had all been blue then it could have looked a bit too much. By leaving the table top wood it gave a good contrast of colour to the legs and fireplace and added interest and texture to the area. The natural wood of the table top would ( no pun interned ) need protecting from the elements and any spillages that may happen and lucky for me Ronseal do a great outdoor varnish. This varnish is perfect as it is non yellowing and also does not add an orange colour to the wood, it allows the wood to keep its natural look but just with a bullet proof layer of protection. The varnish is white when you paint it so you can see if you have any large drips etc. but it dries totally clear which is exactly what I wanted. Once the painting was done it was time to think about styling the space to add the wow factor. Outdoor mirrors are a great way of adding a touch of class to the space and if angled correctly can reflect the lovely green areas of the garden to your seating area almost like a piece of living art work. I found mine on a second hand website and just knew it would look perfect above the fireplace. Once the mirror and been hung all that was needed to make this the perfect setting for a late night glass of summer Rose was some solar lighting. I found some perfect large solar vintage looking light bulbs in Robert Dyas and suspended them on thin rope from the balcony above the seating area. They really completed the look and added a real feature to the space. Finally all that was needed was a few plants to accessorise the space, I chose succulents as they are easy to grow and don’t require too much watering. The hanging planters were from Ikea and I planted them with herbs so that there was a lovely fresh aroma where we sit. I have to say the space has been transformed and it was so easy to do. 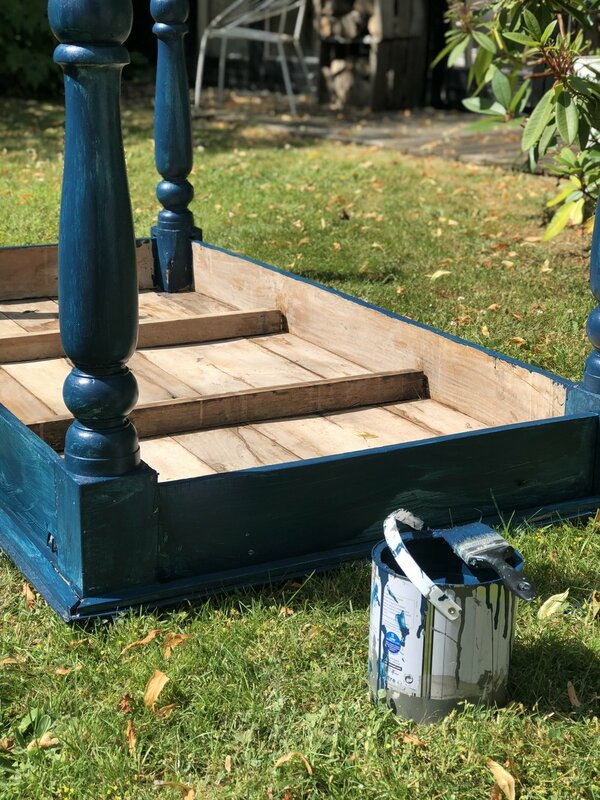 One can of paint had given the old furniture a new lease of life, using this type of vintage furniture and painting it with the Ronseal paint adds a real individual feel to the garden, so much more exiting than a plain boring teak set of table an chairs. I promise you as you sit there, glass of wine in hand on a summers day with your friends it will be worth all the effort. I know the weather at the moment hardly makes you think about sitting out in your garden but its the perfect time to get searching for those second hand pieces of furniture that you can paint up all ready for the summer. Stop something heading to landfill and get creative, keep your eyes pealed for the perfect pieces and good luck.